This comfortable and spacious home is located in the exclusive community of Sandyland Cove in Carpinteria. Sandyland Cove attracts those who appreciate beautiful mountain views as well as unique and exclusive wetlands and beachfront area. 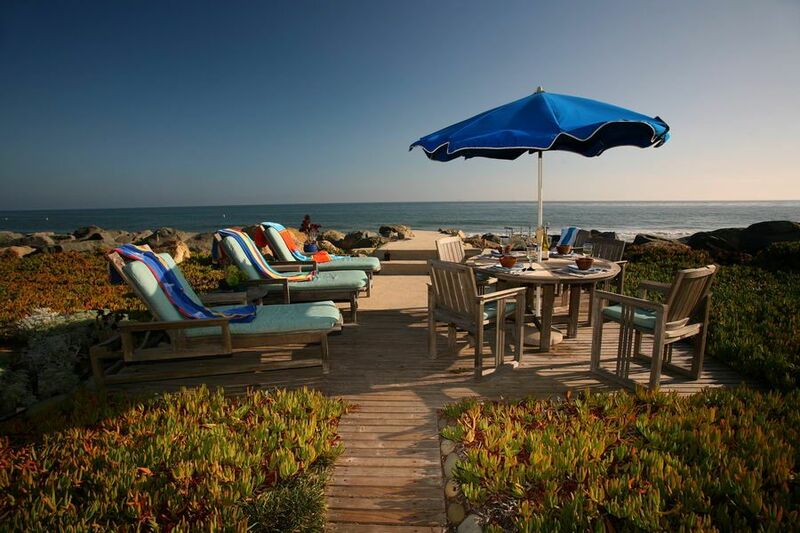 This stretch of beach continues to be one of the most desirable beach areas in Santa Barbara County. A five-minute drive, or relaxing walk, takes you to the tree-lined streets of Carpinteria which offers a variety of attractive antique stores and specialty shops, as well as sumptuous restaurants. Driftwood Beach Retreat offers the classic beachfront experience. Watch dolphins, seals and whales break the surface of a glassy sunrise sea. Pull a Kayak down to the shore, and explore the nearby reef and kelp forests. Take a leisurely morning beach walk to downtown Carpinteria, where a classic breakfast awaits you at Esau's Restaurant. Be sure to visit the beautiful and natural Carpinteria Bluffs, with miles of hiking trails. While there, stop along the way to view hundreds of seals and sea lions at the Seal Rookery. End each satisfying day with sunset soak in the hot tub. The home is a sprawling Ranch style home with 100' of beachfront. The U-shaped floor plan creates a fantastic central outdoor patio for dining and relaxing while being protected from the elements. A fireplace adds warmth and mood to every outdoor gathering. Three distinctive sleeping areas make it a perfect home to be enjoyed by multiple families. Three rooms have twin beds for kids. Each sleeping area has its own bathroom. The central living area boasts a comfortable living room w/fireplace. Just off the living room is the dining room and kitchen (a private chef is available upon request). Escape to the family room and enjoy a book in front of the classic wood burning stove. The media room is a cozy place to cuddle and watch a great movie. The two-car garage and large driveway provide plenty of parking. Quiet Hours are 9pm - 9am. Please be respectful of our neighbors. Guest agrees to electronically sign a detailed Reservation Agreement. Manager/Homeowner reserves the right to deny reservation. Until confirmed, rates are subject to change. Garage parking for 1 car. Driveway parking for 3 cars. Garage parking for 1 car. We had a great time with the family but i was deeply disapointed in the condition of the house food behind the grabage can all on wall, didnt dump grease 0ut BBQ pit all most had fire. towels weren't clean brown streaks marks mom went to wash her face and she got a prize , blood on bedspread ink on sheets. House was so dusty one person had asthma attack. the lawn chairs were filthy bike pumps didnt work,coffee pot didnt work guest had to run home to get one. windows were filthy in master bedroom , we had to clean before we had our weekend. For what my brother payed for this four day weekend party the house should have been clean. the house could use a lot of up grades and a real thorough cleaning . But we had great time and probably would rent again.it was interesting that President Hoover son use to own this house. What a spectacular setting and spacious home to enjoy with friends and family. It was heaven to be out front enjoying the water views and taking long walks on the beach. At night, however, it was super cold and the windows and heating system are old and outdated and don't comfortably heat the house. The managers were responsive, however, and brought over space heaters immediately, but they blew a fuse. And a few of the bathrooms could be spiffed up. Our shower had a fair amount of mold. A few upgrades could go a long way. FYI, if you are a light sleeper, the frequent train sounds can be a hindrance to a solid night's sleep. One final plus: there were lots of beach toys, bicycles and kayaks- great for outdoor fun. Thanks so much for the honest review. This always helps us to improve on the service we provide. As is our policy, we have passed on this comment to the property owners and have asked that they attend to the items mentioned to further improve and better maintain their property. Cleaning issues, if any , will be handled by our crews at the next opportunity. Nearly all the oceanfront homes from Ventura to Point Conception are in proximity to the train. This home is approximately 1/3 mile from the train tracks. Thank you for your input and we hope you return soon!